“The important thing in life is not success; rather it is the path and steps we take to achieve success” – Gerard Bertrand. It’s not often you attend the launch of a partnership between one of the world’s leading winemakers and their importer, and come away with philosophical debate about the essence of life and joie de vivre. Sure the focus was on the wine – the importer Summergate launching its partnership with Gerard Bertrand wines – in China. And, yes, the wines paired with the sumptuous dinner at le Royal Meridien stand alone for sheer quality, finesse and expression of Provençal terroir; but it would be doing this review a complete disservice if it didn’t first focus on winemaker Gerard Bertrand; second generation winemaker and custodian of precious land and ancient vines. Gerard is big man. His handshake threatens to engulf your whole arm, and his presence simply says he is winemaker completely at the top of his game. Dwarfing most of us, Gerard shared with a rapt gathering of 50 guests his heritage, from starting in his father’s cellars as a ten year old, to juggling 6 day weeks in the vineyard with a successful International Rugby Union career, to now carrying on the legacy his father left him. His wines are as firmly structured as that handshake, the expression of fruit carrying the same depth and warmth as his nature. A champion of organic wines and biodynamic viticulture, Gerard commanded rapt attention from the invited guests representing many of China’s wine and food industry leaders. The joy of the occasion was enhanced by Poppy and her exquisite and highly entertaining translation of both Gerard’s and Summergate director Ian Ford’s speeches. 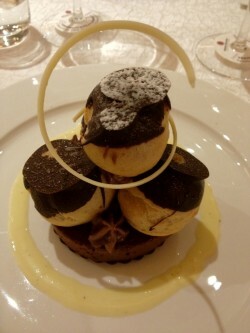 Starwood’s Le Royal Meridien in Nanjing Dong Road hosted this launch, with vibrant, creative chef Rembrandt Van Der Laan creating one of the year’s great menus for this occasion. The 2010 reserve Speciale Chardonnay was served as a welcome drink, its crisp rich palate perfect after coming in from the humid wet evening in Shanghai. The Plum rains shut out any hope of looking out upon the spectacular view from the restaurant on the 64th floor, and so guests zeroed their focus even more onto the food and wine. The 2010 Reserve Speciale Viognier paired spectacularly with Van Der Laan’s first course, a wicked Foie Gras terrine, sharp mango chutney with a reduced Oporto wine jus. The rounded, lightly apricot and honey nose and brace of acid was perfect with the mouse – like richness of the terrine. The Cigalus wines have developed a bit of a cult reputation, and the 2010 Domaine de Cigalus 2010 was in mint condition, the Chardonnay, Viognier, Sauvingnon Blanc blend exhibiting refreshing citrus, gentle florals and white fruits. There is rich twist to both the nose and the palate, no doubt the quality of viognier shining through. This is a fresh wine, lively and rounded with ripe fruits, perfect with the course of seared scallops, caviar in a cauliflower veloute. Very clever dish this; the scallop perfectly seared and quite the star. 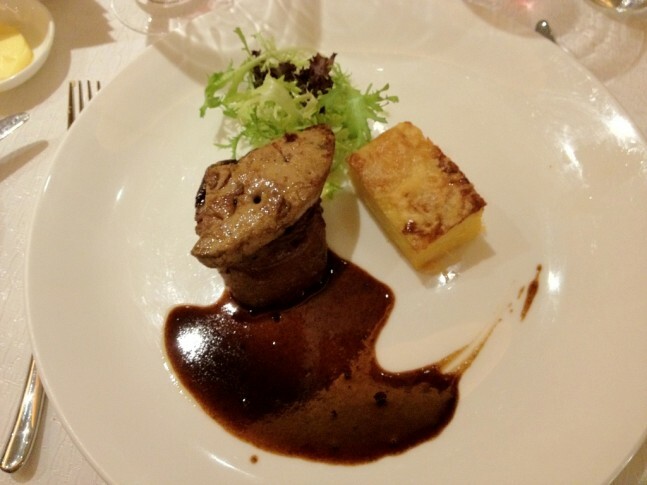 A brace of wines were served to accompany the Angus beef fillet, perfectly medium rare with duck liver atop, potato dauphine and perigourdine sauce. The 2010 Domaine de Cigalus Rouge, a blend of Cabernet, Merlot and Syrah, was paired alongside the 2009 Chateau l’Hospitalet Grand Vin Rouge. This was actually a very wise pairing. Distinctly different in their varietal make up, nevertheless there was, what Gerard explained, as the signature almost salt-like acid running through these wines, courtesy of the limestone soils where these vines thrive. The Cigalus was quite tight, with intense dark fruits and rich toasty oak. The palate was rich – think the same dark fruits coming through on a broad palate, a lick of mint and spice from the Syrah rounding out the mouth. Some plummy Merlot fruit gives this wine added complexity and it finishes long. On the other hand the l’Hospitalet leaps out of the glass with aromatics; the blend is 50 % Syrah, 40% Mourvedre and the remaining 10% Grenache from ancient old vines. Spicy, berry notes and sweet rich florals flow through to the palate, which is round, deep and quite long. Both wines, and in fact all the red wines, have this signature balance I spoke of; Bertrand told me his fascination is the blending process. He will personally sample individual barrels, agonizing over the final components, which will go into these single vineyard and AOC signature wines. We were lucky enough to be served two extremely special vintages; the 2009 Parcelle Le Viala Minervois La Liviniere AOP, a powerful blend of Syrah, Grenache and Carignan exuding again these wonderful wild Provençal flower nuances mixed with deep dark beery fruit. This was simply served with a selection of cheeses, along with the final wine of the night, the 2008 Parcelle La Forge AOP Corbieres Boutenac. This gorgeous wine is a 50 – 50 blend of Carignan and Syrah, a wonderful aromatic nose of exotic spice and clove, at once mouth filing and long, the spice lingering a full two minutes. Gerard explained in great detail, the legacy he has been left by the generations before him, and the uniqueness of that over used term ‘terroir’. In its own way this was a South of France master class for many of us. The Languedoc Roussillon region is renowned for expressive aromatic wines with great intensity of colour, flavor and true varietal expression. 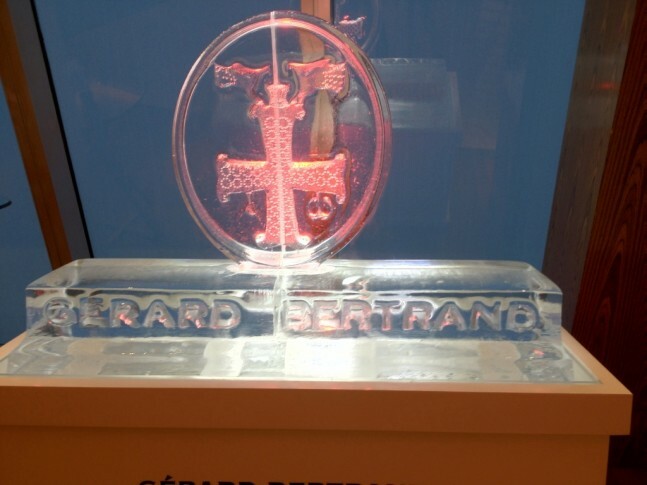 Bertrand has for the past two decades helped drive development in the region, growing the business from 200,000 bottles to 12 million bottles, and an extraordinary 4 employees to over 170! With seven estates to manage, it is the epitome of a dynamic family owned winery group. Often times we enjoy wines and we have no idea who blended or crafted them. With Gerard Bertand you can’t help but taste in all his portfolio his hand and probably that of his fathers, that synergy between man and nature, which can only come from commitment to that journey, mentioned at the start of this review. 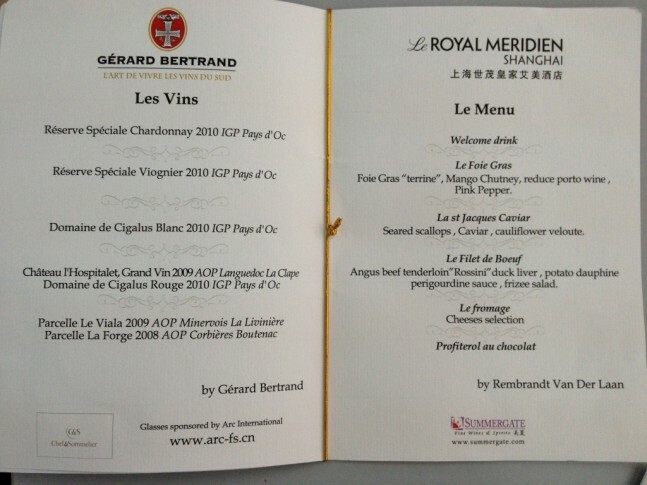 And balance; Bertrand is excited and super confident his wines will prove to be superb matches for Chinese cuisine. Well, they already are. Their expression of fruit, the harmonious balance between alcohol, acid and tannin, and the depth of this portfolio cater for the wild diversity of Chinese regional food. You can easily find their wines in Shanghai, from the extremely knowledgeable and passionate staff at Pudao wine, PHONE: 6090 7075. ADDRESS: Ferguson Lane, 376 Wukang Lu, in the French Concession. Phone: (86) (21) 3318 9999. I highly recommend you seek out their food to experience a seriously fine chef cooking some sensational modern classic food. You might even get the great view!